TWITTER Censors 32 of Donald Trump's GOTO Battleground Tweets! ...Deletes Another! TWITTER Censors 32 of Donald Trump’s GOTO Battleground Tweets! …Deletes Another! On October 3, 2016 Twitter deliberately “shadowbanned” (censored) 32 of Trump’s tweets, plus it deleted one other tweet. When Twitter shadowbanned Trump’s tweets, the general public can no longer see any of the tweets, and only users who replied or re-tweeted the tweet’s can see said censored tweet — or if one knows the URL/web address of the tweet, one can see said censored tweet. What makes these shadwobanned tweets so significant and important is that they are regarding BATTLEGROUND STATES! 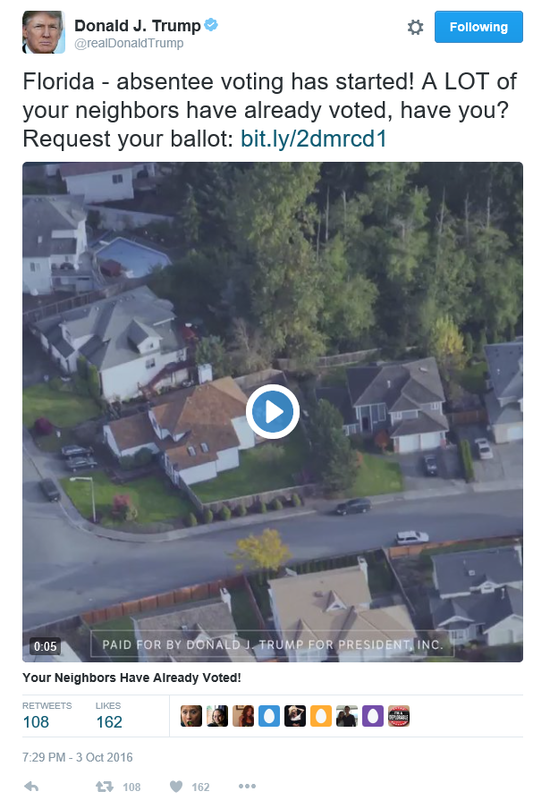 The shadowbanned tweets are Trump’s Twitter effort to get his followers registered to vote, and to get people to request their absentee ballots in those BATTLEGROUND STATES! Twitter is actively sabotaging Trump regarding battleground states! Donald Trump GOTO Georgia tweet. Take note that hardly anyone re-tweeted or liked this Florida tweet. This Florida tweet, like all of Trump’s tweets, would have garnered thousands of re-tweets and likes. 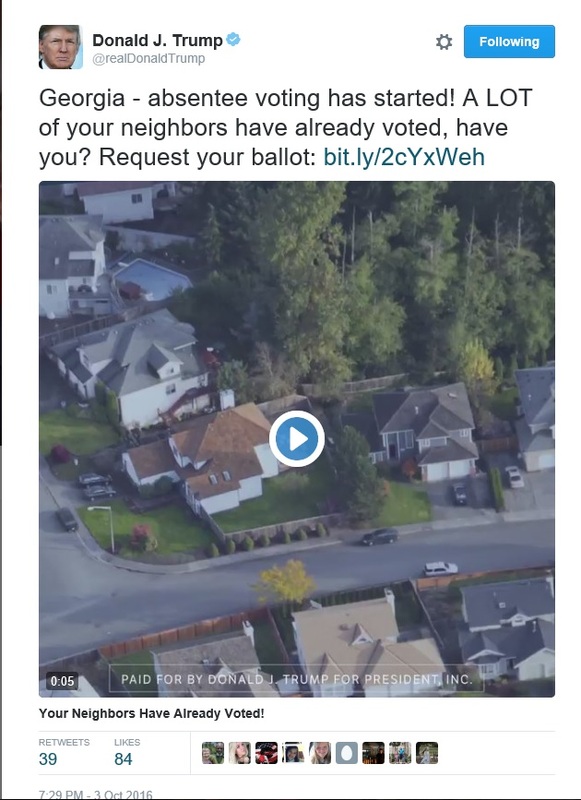 There was obvious plans by Twitter, that if Trump ever made a push for people to register to vote in a battleground state, Twitter would censor those tweets. All of the 33 tweets in question show that Trump’s tweets were probably pre-screened by Twitter, then were shadowbanned immediately thereafter being published live on Twitter. We know this because some people actually re-tweeted and liked some of the tweets. Of note, there was one tweet that was deleted by Twitter. This deleted tweet was the first one that was sent out by Trump regarding his register-to-vote push on October 3, 2016. Twitter probably didn’t catch that they deleted the tweet instead of just shadowbanning it. Obviously the Trump campaign is unaware of this vile sabotage by Twitter. UPDATE: This wasn’t the first time! Twitter censored Trump’s tweets earlier this year asking for donations!